Gr 1-4 –Readers are treated to a colorful historical account of a well-known board game, and the socioeconomic factors that affected its development. Stone, Tanya Lee. 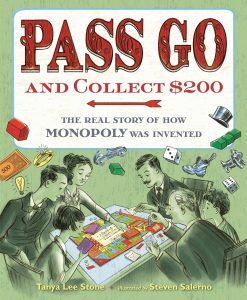 Pass Go and Collect $200: The Real Story of How Monopoly Was Invented. illus. by Steven Salerno. 40p. bibliog. Holt. Jul. 2018. Tr $18.99. ISBN 9781627791687.